The University of California Cooperative Extension Bay Area Livestock and Natural Resources Program conducts applied research and outreach to promote working landscapes that conserve biological diversity, protect water quality and sustain livestock production. This website provides research-based information to land managers to keep rangelands working. The San Francisco Bay Area has more open space within its borders than any other metropolitan area in the US. While so much open space provides a scenic landscape and exceptional opportunities for outdoor recreation, it also supports the area’s most prevalent land use, cattle ranching. 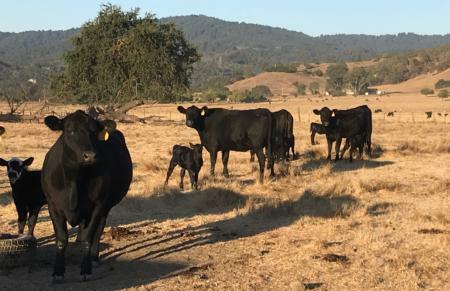 Whether the working ranches are on public or private land, many Bay Area ranchers represent a fourth, fifth, or sixth generation stewarding the land and their livestock, drawing on older traditions while using modern practices. Ranching or working rangelands describe the land use of over 1.7 million acres of the Bay Area’s 4.5 million acres of open space. Rangelands that produce both livestock products and ecosystem services are known as “working landscapes” in the Bay Area. 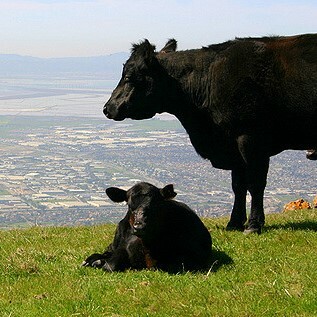 The PDFs below provide an introduction to current topics about sustainable livestock operations, livestock behavior and needs, and compatibility with nature conservation and recreation on the Bay Area's working rangelands. Use the site navigation to dive deeper into these topics. The fact sheets begin with “A Year in the Life of a Cow," which describes beef cattle productions systems, including why grass-finished beef is not widely produced on public open-space lands and the important role of animal feeding operations in supporting rangeland livestock production. “Grazing Benefits” provides research-based information about the role of livestock grazing in managing open space. “Sharing Open Space: What to Expect from Grazing Cattle” informs park users about cattle behavior, given that negative interactions between dogs and cattle in parks have been reported. “Bay Area Ranching Heritage: A Continuing Legacy” describes the long heritage of ranching in California, focusing on the Bay Area, and the importance of public lands grazing; most ranches now depend on some combination of owned and leased land, including both private and public for their livestock operations. “Cattle, Sheep, Goats, and Horses: What’s the Difference for Working Rangelands?” explains how livestock affect land and vegetation in interrelated ways, including removal of leaves, stems, and other plants; removal or redistribution of nutrients; and mechanical impacts on soil and plants through trampling. “Cows Need Water, Too: Water Sources, Wetlands, and Riparian Areas” describes the variety of water sources used by cattle and how some grazing impacts in wetlands can be beneficial in supporting threatened and endangered species. “Grazing Systems Management” provides information on the types of grazing systems ranchers use to manage forage productivity, soil health, and biodiversity. All documents published in 2015; Barry is lead author or co-author.